History is a many layered thing. Historians help us peal those layers back and look inside. From this, we can draw our own conclusions and then we can choose to agree or disagree with their argument. We can look back with all the preconceptions and beliefs we hold dear and make distinctions or we can embrace new thoughts and views on a past we thought we knew. Yet, we still do look at the black and white of the past and all too usually forget to see the shades of grey. When we see those images transformed into vibrant colour by an artist with the talent of Marina Amaral, this can help our preconceptions to fall away and we may things see a little clearer. The Colour of Time is a collaboration between Amaral and historian Dan Jones where they use two hundred images taken between 1850 and 1960 to tell the story of us. Looking at the images that Amaral has so carefully (and as historically accurate as possible) returned the colours too that the camera bled from, you see a life you may have missed before. Each image is accompanied by a text from Jones that brings the context to the images. Jones has a very vivid prose style in his work and this totally compliments the image you are looking at. The Colour of Time reads almost as a perfectly curated gallery visit. Each section a new room moving you forward in time with, on one hand, the great and good and on the other, the likes of you and I. Trying to describe the effect each turn of the page is not something I really want to do, you have to experience it for yourself. But I will talk about my favourite image, found on page 60. That of the Empress Dowager Cixi. When I turned the page and saw the image of Cixi, I was taken aback. It is a remarkable image of a woman wearing ultimate power with the ultimate lightness. In this image, I saw the woman I first encountered in the pages of George MacDonald Fraser’s Flashman and the Dragon. Flashman’s is a jaded eye with which to view history through, but Fraser shows the fierce intelligence of the woman. As she maneuvers to take control as Peking literally burns, Cixi is one of the most remarkable of the many historical figures Fraser brought to life. In Amaral’s image, Cixi is seated, dressed in grandeur and looking wonderfully bored. I think it is her look I love the most about this image. Only utter confidence in her power could allow that look of bored indulgence while having her picture taken. She had taken control of an empire and ruled it with a skill that China would never see again. Plus, the golden apples look incredible. It is an image which brings soul, life and personality to someone who could so easily be lost to the pages of a Flashman novel. Picking on just a single image does not do the book justice. Each page is alive with such vibrancy and depth that talking about how only one moved me hopefully shows how remarkable this book is and the sensitive and authoritative work Amaral does with each image. Whether it is Gardner’s image of the dead at Gettysburg or Alfred Dreyfus staring his innocence defiantly at us following his degradation, each image is alive. When we find something new, Jones’ text helps us to find the place and try to understand what is happening. This sensitive marriage of image and text is subtly yet impressively done. Jones is able to convey the awe or the horror either side of the moment that the shutter closed in just a few well constructed sentences. While I could complain that the Dreyfus text doesn’t mention Lt Col Georges Picquart once, that Jones is able to encapsulate the Dreyfus Affair in about 200 words is a remarkable achievement. The Colour of Time could well have ended up a gimmick. Colourisation is very tricky thing to do right and the internet is full of proof that anyone with a Photoshop licence cannot do what Marina Amaral does. The painstaking research Amaral does is coupled to the heart she brings to her work and the results are clear to see. Dan Jones’ text only heightens this. Every page is a treasure and you will find something new to wonder at each time you return to The Colour of Time. And that simple fact is what good historians do, make us return to history and, hopefully, learn something new each we look into the past. 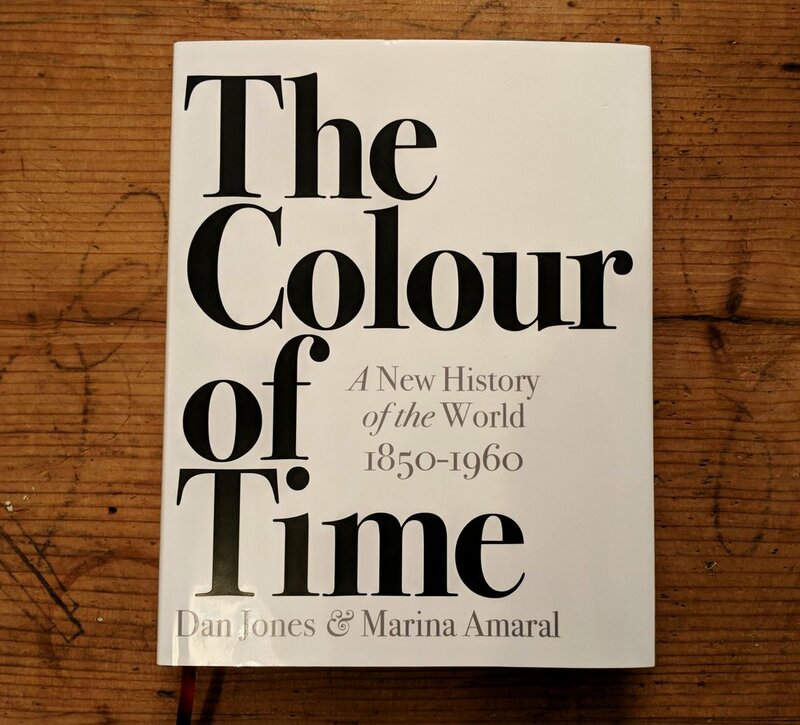 The Colour of Time by Dan Jones and Marina Amaral is out now from Head of Zeus. RRP £25.